Forget what you thought you knew about student accommodation! We’re reinventing #reslife one city at a time. Our state-of-the-art student accommodation is setting a new trend in South Africa. Become a Respublican today. Check out our clean, modern residences in Pretoria, Jo’burg , Bloemfontein and Cape Town and get in touch! We can’t wait to meet you! Uncapped Wi-Fi, computer centre, gym, laundry, and more! Roscommon House will be officially opening its doors to students in January 2019. It is located on the corner of Main and Roscommon Road, in the heart of the trendy and vibrant residential suburb known as Claremont, in the Southern Suburbs of Cape Town. Saratoga Village is perfectly situated in Doornfontein right across the road from the University of Johannesburg. With the Doornfontein Campus bus stop on our doorstep, we can also be home to WITS, CJC, UJ Auckland Park and Soweto Campus students. The Fields is a state of the art residence within stone’s throw from the UJ campus in Doornfontein. No, we don’t encourage the throwing of stones – we just mean you can walk. You should walk. It’s also in the heart of all things sporting in Jo’burg, so your weekends are sorted! The brand new Yale Village is located directly opposite the main entrance to WITS on Empire Road – it doesn’t get much closer than that! We’re just up the road from UJ APK, and with all the major bus routes going past Yale it’s super easy to access that campus too. Eastwood Village is ideal for TUKS students. We opened this res in January 2016 and started creating our legacy – now we’re passing the torch to you. Whether you’re a first-year waiting to make friends or a group of friends returning to share an apartment, we know you’ll find our res comfortable and inspiring. This is one of our newest and most modern developments to date – think rooftop running track, and slides between floors – how very Google! 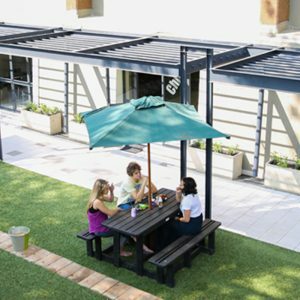 Hatfield Square is virtually on the UP campus, so it’s perfect for TUKS students. You’ll also be within walking distance from the university book shop, grocery stores and a variety of restaurants. Our smallest residence, the comfortable Urban Nest is conveniently located in the quiet and leafy suburb of Arcadia. It’s ideal for TUKS students, TUT students, and students from a host of colleges in the area. Perfect for TUT students, West City has a regular and safe bus route that stops on our doorstep. You’ll be joining our family of over 1000 people in this vibrant res. Even though we’re a huge res, it still feels like you’re part of a community. Princeton House is a totally revamped res with completely new apartments, recreational rooms, outdoor facilities and Wi-Fi technology. This awesome res now includes state of the art biometric access control and CCTV security, a swimming pool and a new outdoor entertainment area. Lincoln House is the latest addition to Respublica’s vibrant student living community,located in the leafy suburb of Universitas only 250m from the University of the Free State. Want to self-check-in? No problem. Apply online, pay and upload all your docs and you can self-check-in! No queues, no fuss!